Hi friends! Let’s start off with a quick poll: whose kids love Mexican food? In our house, Taco Tuesday is the best night of the week, giving a much needed respite to mom (me!) while the kids do much of the meal prep. Plus, everyone is able to customize their meal and therefore we are guaranteed 100% satisfaction. 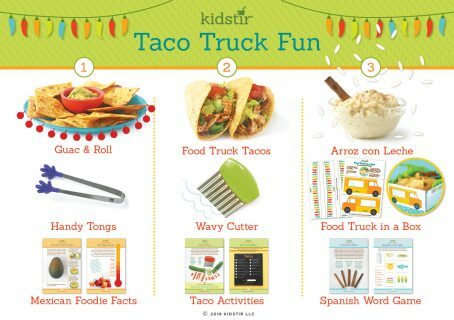 To make Taco night even more special, we’ve themed a whole Kidstir kit around it : Taco Truck Fun! I’m happy to share that this single kit is available in our Store for everyone, at any time- you do not need to be an ongoing subscriber to get it! As such, it’s perfect as a one-off birthday present, or a kit to “taste-test” before you decide to subscribe for a longer term, or an extra kit for a chef who’s gone gaga for all their other Kidstir cooking kits and just wants more, more, more! And hey, once you try it out, we wouldn’t blame you! After all parents everyone just selected Kidstir as a favorite, earning us a Parents Picks Award. I’m sure you’re wondering what’s so awesome about this kit that makes it one of the most popular ones of all, and don’t worry, I’m about to tell you. These recipes and tools hit just the right notes in terms from familiar to sophisticated. Let’s get to it! Guac ’N Roll. Oh yes, I’m talking about the good stuff. I hope one day we’re all lucky enough to eat fresh guacamole made alongside or just before our meal. Because it.is.heavenly. Packed with flavor (and happily, nutrients too! ), real, fresh guacamole is everything. It might feel a bit intimidating at first, which is why we’ve broken down the recipe step by step with gorgeous photos that you and the kiddos can follow along to. We’ve got a handy tutorial for you here, so be sure to check that out to learn the safe way to cut up your avocado. Once everything’s cut up, the fun part begins- smashing it up with all your favorite add-ins! And then, even better, make some amazing tortilla chips to scoop up your guac! Our healthy twist on chips to dip is so tasty, and super easy too. Check it out here. Food Truck Tacos. I love a good food truck. A neighboring school has a food truck festival at a local park each year for their annual school fundraising drive. Families turn out, lay out their blankets, then go hunting for different types of food at the various trucks. It’s so fun to experiment and have a little of this and that. Hugely popular, of course, are the Mexican food trucks. In our taco recipe we show you and your little chefs how to make a great spice mix base full of authentic flavors. No need to buy a packet which might have preservatives at the store. You can use your own spices and mix them together in just the right amounts. Cook your chicken in this spice mix, and your kids learn how to safely work at the stove, handle poultry (an important skill), and elevate their tacos from basic to wow. They can then add all their favorite freshly chopped ingredients on top to customize their creation. When they’re ready to do a little more, work together to make a homemade salsa too…tomatoes are always best fresh and this salsa will not disappoint! Arroz con Leche. When I think of Mexican sweets the very first thing that comes to mind are churros (try our amazing spin on churros here: – there is no going back! ), and then maybe flan. Why do I not think of Arroz con Leche? I should! Because it is a divine dessert that pretty much pleases everyone. I personally love flan, but it’s sort of polarizing. Some people like it and others don’t. Our Arroz con Leche (a rice milk pudding flavored with cinnamon) is universally beloved. You must make it. It’s a great, easy recipe that will earn you and your little chef rave reviews and leave a sense of pride that will last and last. You know a big part of the fun each month upon opening up our kits are the kid-friendly, high quality cooking tools and activities inside. Here are the goodies this month! Handy Tongs. These are so cute! Not only are they perfect for all sorts of cooking tasks in this kit, they are just so useful to have around the kitchen. I use them all the time! Your little chefs are going to have so much fun turning over their baked tortilla chips with their new handy tongs! Wavy Cutter. This tool is amazing. Kids cooking experts everywhere have recommended it as a great way to get kids of all ages involved in the kitchen. Whether it’s chopping lettuce or bell peppers even the younger ones can lay some veggies flat down on a cutting board and easily and safely cut them with this wavy cutter. I know that some of the bigger kids, and adults, will like using it too! There’s so much great learning packed into this kit beyond the yummy recipes and high quality cooking tools. You’ll find Mexican Foodie Facts, Chef’s Secrets Avocado Tips N Tricks, Secret ingredient Hot Pepper Scale (eat some yogurt or drink some milk if something’s too spicy hot! ), and Chef’s Secret to make extra Crispy Chips. In Taco Activities we will show you how to use your Cool Tool Wavy Cutter, there’s a fun Math in the Kitchen Taco Truck Menu (ring it up! ), and your kid chef will learn our Chef’s Secret How to Warm Tortillas. Then, there’s also Spanish Word Game World Culture Spanish at the Table, Chef’s Secret How to Grate Cinnamon, and Food History Cinnamon Sticks (wars were started over this spice!). But don’t stop there. You can get more recipes, learning ideas, and games at our Kidstir DIY page. 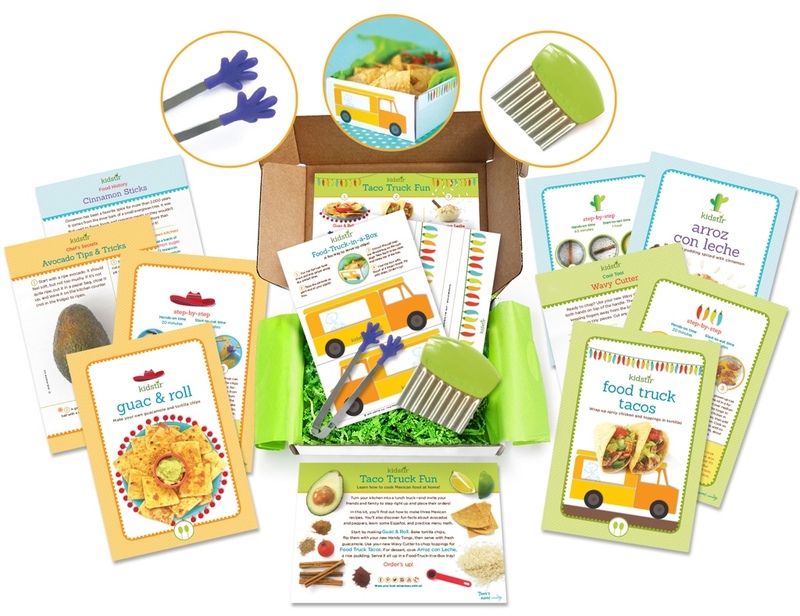 You are guaranteed to love our Taco Truck Fun kit. It it is a winner through and through! Please do share all your fun experiences, and tips and tricks, with us on Facebook, Instagram, Pinterest, and Twitter. We love letters with photos too, which you can send to email hello@kidstir.com.